The Vollrath 48765 6 qt. Silverplated New York, New York retractable dripless round chafer is an elegant solution for your buffet or catering operation. 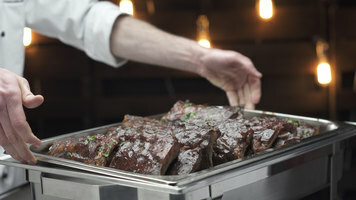 Its distinctive, upscale appearance will accentuate any food presentation! Its standard-setting look and durability make it a favorite of hotels, restaurants, and caterers seeking quality, elegance, and value. It features a beautiful, brilliant, mirror-finished heavy duty 18-8 stainless steel body with clear- coated brass accents that's durable and easy to clean. Plus, its solid legs and welded construction mean it will hold up to years of heavy use. A premium, 3 micron, 99% pure silverplate finish provides an exquisite and durable finish that's easy to maintain against tarnishing. Depending on use and care, it should last an average of 5-10 years. Its breakthrough hinge design works in closed, 90 degree, and fully open positions for serving flexibility, and has no switches or levers. 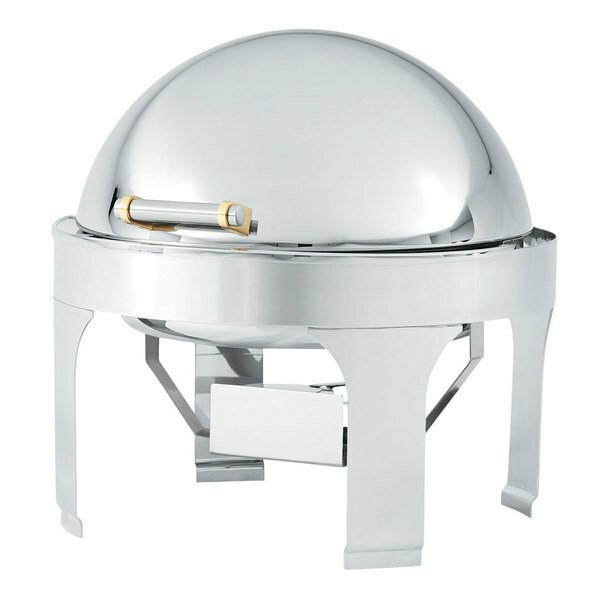 Other useful features of the Vollrath silverplated New York, New York round retractable dripless chafer include a wind guard to shield the fuel in outdoor use, and a specially-designed channeled cover that accumulates condensation and directs it into the water pan instead of your food!